What is the path of truth and where does the Christian find the way to it? St. John stresses first of all that the Saviour of the world indicated to everyone without exception the way of the cross – the way of life, the way of glory, the way to the City of Life, the way to the Kingdom. Without the cross there is no salvation for the soul, there is no hope for eternal rapture. There is no other way towards life and genuine inner peace safe by way of the holy cross. The entire time of our life is given to us in order to learn to bear our cross, and when the Lord comes to judge people, it will be the symbol of the cross that will appear in the heavens – this symbol at the last trial will be the sign by which the Lord will know His elect. What constitutes a cross and what are the different kinds of crosses? A Christian’s cross is not only the visible sign of the cross, but also the decision to lead a virtuous life. According to Gospel teaching, a Christian’s entire life is a cross and suffering. This is particularly confirmed by the Lord’s words that “whosoever does not take up his cross and does not follow Me, such a one is not worthy of Me.” To bear one’s cross is to endure everything that brings sorrow, everything that causes suffering. To bear one’s cross means to endure in this world all the grief that the world causes for the sake of Christ. “To take up one’s cross, – says St. John of Tobolsk, – signifies readiness to die for Christ, signifies a spirit disposed to fearlessly meet every threat in the name of Christ, signifies non-attachment to this life.” God summons us to give Him one thing – to give Him ourselves, bearing our crosses. God does not demand any other price safe ourselves. The angel who spoke with St. Stavrophila pointed out various crosses to her: a cross with swords, lances, scourges, fetters, and chains “signifies the diverse sufferings of martyrs for Christ”; there is, for example, a cross of illness, which is not only beneficial, but sometimes even necessary; there is a cross to which are attached a staff and a sack – that is the cross of poverty. (Poverty and destitution can also serve as guides to virtue, if only they are born conscientiously. It is well-known that the acquisition of wealth is connected with many cares, the guarding of wealth – with fear and anxiety, and the loss of wealth – with great sorrow). Stavrophila took note of the cross which stood near the bed and asked about it. The angel explained to her that that particular cross signified sorrow at the loss of parents, relatives, and friends. Although it is difficult to lose loved ones, yet we should not grumble – they were taken away by the One Who had granted them in the first place. 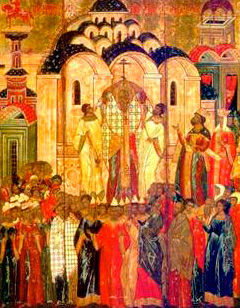 Afterwards Stavrophila noticed a cross with the image of a madman. The angel explained to her that this is the onerous cross of mockery, humiliation, and insult. Those who truly bear this cross are not ashamed or afraid to be mocked for the sake of Christ. Many Christians wish to serve God, yet at the same time seek glory and fame among people, loving humility without humiliation. St. John points out that oftentimes humiliation leads a person to gain an understanding of himself. Often a person is burdened with many diverse crosses. 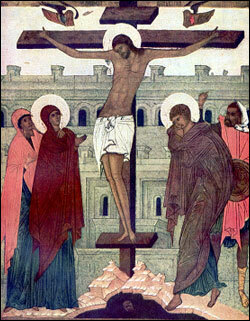 In his oeuvre on the cross, Metropolitan John of Tobolsk most frequently mentions two examples of crossbearing: in the Old Testament – St. Job the Much-suffering, who accepted all deprivations and suffering so uncomplainingly, and in the New Testament – the Lord Jesus Christ Himself, of course, Who alone endured all the sorrows on earth and commanded us to endure our own sorrows. Why is sorrow so inseparable from Christian life? Why does the Lord wish His elect to experience trials and tribulations and not be able to attain the Heavenly Realm without a cross? The Benevolent God has set it up so that whoever wisely bears his sorrows in this life will experience joy in the next one, while those who seek worldly joys will end up with sorrow. We find a vivid example of this in the parable of the rich man and Lazarus. St. Basil the Great notes that the rich man suffered so greatly in the flames not for unjust deeds, but for a voluptuous life. Lechers, moneygrubbers, the rich, and the ambitious – all bear their crosses. In all of those states there is something which causes sorrow and suffering. Carnal sin has the characteristic of stinging the one who engages in it. St. John of Tobolsk offers the following comparison: “Carnal delight is like a bee which, while delivering sweet honey, pricks a person with its sharp sting.” And wealth is often labeled as bramble in the Gospel: just as brambles prick and bring pain, so is wealth acquired with great effort and guarded with great fear, while the loss of wealth is united with great suffering. A rich man is constantly concerned over acquiring or guarding his wealth. And is not an ambitious man to be pitied? In order to attain power over people, he must first become a slave and demean himself before others. St. John of Tobolsk teaches that man must prepare himself for the way of the cross. The Lord said that whoever wishes to follow Him must deny himself and take up his cross. St. John explains that self-denial involves three actions: denying oneself, taking up one’s cross, and following Christ. What does it mean for a person to deny himself? “A certain youth, wishing to rid himself of sinful love for a prostitute, went off to a distant land. When his passion quieted within him, he returned to his home country, and meeting his former beloved, paid no attention to her. The prostitute, quite surprised at this, thought that perhaps he did not recognize her, and coming up to him she said: “I am so-and-so.” “But I am no longer the same person,” – replied the youth and departed from her. The Cross – confirmation of the faithful. How to follow the way of the cross? With what attitude of soul should we accept and carry our cross? What are the conditions of genuine and salvific crossbearing? What kind of cross should we bear, and what is the duration of our crossbearing? “Why is it wrong to ascend into heaven according to one’s own will?” – asks Stravrophila. The angel replies to her with the words of the venerable Elder Mark: “Because one’s own will is the leg of pride, and with it no one was able to ascend into heaven. Whoever goes along willfully and without reasoning and the instruction of the Gospel, such a person will stumble a great deal. 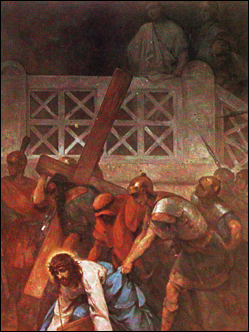 Many people undertook great spiritual labors, underwent much deprivation and suffering for God’s sake, but because they acted willfully, without reasoning, and thought that they did not need help and instruction from others, all their efforts turned out to be fruitless and in vain.” One should not grumble about one’s cross being too heavy. It only seems great. In reality it is not so, but only seems to be so to those who do not look upon it properly. People are agitated and suffer not so much from the cross itself, but because they have a wrong perception of it. It happens that one and the same cross is placed upon two people. To the earnest person it seems light, while to the fainthearted one it seems heavy. The cross is one and the same, but the difference is in the perception of it. We always think that our grief and our cross are the heaviest. Thus, someone who suffers from his eyes, believes his illness to be the most unbearable. Whoever suffers from whatever will always believe his own suffering to be the worst in the world. The cross must be borne daily. St. John instructs us: “The cross is of great duration, but do not abandon it, for your reward will be eternal. Constancy will sweeten the very effort. If someone exercises in something daily, that exercise becomes increasingly easier with time, and then the habit itself will turn into nature… Those who sail the sea for the first time are agitated and fearful, not being used to it, while those who have sailed many times and have experienced numerous tempests, bad weather, various dangers and shipwrecks, feel calmer in their ships than many do who remain on land… Daily labors and patience ease the heaviness of sorrows for us.” The archbishop then explains that not a single cross will seem protracted to us if we give it width, length, and height. The width is love – it only does good and makes sure that the good that was done does not perish. The depth lies in courage and long-suffering. To measure the height of the cross means to project one’s mind upward, towards the Lord God. Whether we wish it or not, we must still bear our cross and sorrows. If we bear them with gratitude, we will then earn the greatest rewards, while if we become impatient and grumble, then not only will we not ease our burden, but we will make it even heavier. As we bear our cross, we should remember that another necessary ingredient is prayer. Prayer greatly eases the cross and provides help in all sorrow. The more a Christian appeals to God, the less he thinks of his sorrows. Whoever has his mind aspiring constantly towards God can no longer pay too much attention to the sorrows of the cross. Let us ponder these ideas of the hierarch. First of all, we must bear our cross as a punishment. Does not man, who offends God every minute, deserve punishment? If we accept the fact that we have received our cross for what we have done, then we will endure it good-naturedly. In the face of all kinds of crosses and all kinds of sorrows, it is useful to keep in our hearts and our minds the thought that we are suffering justly because we have sinned. Secondly, in bearing our cross we must have hope of reward. The soul which hopes for reward endures everything willingly, and from among everything that it endures it counts nothing worthy of comparison with future benefits; thus it joyfully accepts everything, in order to receive that for which it hopes. Every effort seems lighter when it is expected to be rewarded. If people work so strenuously for their daily subsistence, what kind of labors would they not undergo for the sake of eternal life? Thirdly, the cross should be borne out of love for Christ. True love does not feel bitterness, but rather sweetness. Whoever loves does not become fatigued, because for a loving heart all effort is pleasant. Whoever works for God with a love which expels fear, such a one does not feel the burden, does not experience the sorrow, does not seek reward. For those who have acquired love for God, neither fire, nor sword, nor poverty, nor illness, nor death seem burdensome. In concluding the second part of his teaching on the cross, Metropolitan John speaks of three forms of crucifixion: crucifixion of the flesh, crucifixion in respect to the world, and co-crucifixion with Christ. Before going on to the fruits of crossbearing, let us briefly turn our attention to these three forms of crucifixion. (1) Crucifixion of the flesh. We are speaking here of the fact that not all of us are slated to be actually crucified on a cross. Only some of God’s very elect received such a fate. We must imitate Christ by figuratively crucifying our flesh through suppression of all its passions and lusts. (2) Crucifixion in respect to the world. We crucify ourselves in respect to the world only when the prince of the world, i.e. the devil, comes and does not find anything of his own in us. And the world will crucify itself in respect to us when we refuse to accept any sinful desires. Love for Christ’s cross engenders life, while love for the world leads to death. Thus it is necessary for us to become mutually dead to each other: we to the world and the world to us. In speaking of this world we do not mean nature, the heavens and earth, but rather sinful everyday deeds – human glory, honors, praise, wealth, delights. The Lord’s words on this subject are quite apt: “If the world hates you, ye know that it hated Me before it hated you. If ye were of the world, the world would love its own; but because ye are not of the world, but I have chosen you out of the world, therefore the world hateth you” (John 15:18-19). Cross – glory of the angels and wounding of the demons. What are the fruits of crossbearing? The venerable Anthony and Theodosius the Great erstwhile prophesied that in the end times zeal towards the labors of Christian life will weaken, and there will no longer be such holy fathers as those who shone forth in ancient times with their endeavors and grace-filled gifts. Piety will fade, and monastics will live in the world without differing in any way from laymen. But among these Christians of the end times, as the ancient holy fathers of the Church had prophesied, there will be those who will be saved through endurance of sorrows, i.e. their crossbearing. In God’s eyes they will be greater than all the great ascetics of ancient times.